Volleyball court dimensions vary depending on league standards, age of participants and whether the match is held indoors or outdoors. The following guide will explain official volleyball measurements and sizes for just about any league in a Q & A format. Here are the dimensions broken down by league and playing venue. High school volleyball court size: 60 feet (18.29 meters) long by 30 feet (9.14 meters) wide. 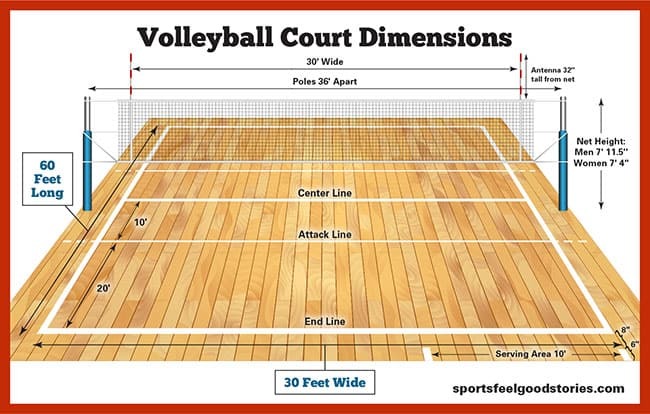 Official dimensions for indoor volleyball courts: 59 feet (18 meters) long by 29.5 feet (9 meters) wide. Official court dimensions are set by the FIVB governing body. Court dimensions: 52.5 feet (16 meters) long by 26.25 feet (8 meters) wide. The width of the court and length have lines marking the boundaries. Recreational sand dimensions features a playing area that is 52.5 feet (16 meters) long by 26.25 feet (8 meters) wide. The international governing body for all forms of volleyball is the Fédération Internationale de Volleyball (International Volleyball Federation), also known as the FIVB. The FIVB organizes major volleyball events such as the Olympic Games, World Championships and World Cup tournaments, as well as managing and standardizing competition rules. What are Official FIVB volleyball court dimensions? The FIVB requires that the volleyball court surface must be a symmetrical rectangle, with dimensions of 18 meters (or 59 feet) long by 9 meters (or 29.5 feet) wide. Each side of the court measures 9 meters by 9 meters square. The free zone refers to the playable area outside of the boundary lines – both side lines and end lines – of the court. For FIVB official competitions, the free zone must be a minimum of 5 meters (16 feet) and a maximum of 6 meters (20 feet) from the side of the court and the end lines. What is the attack line? The attack line is 3 meters for NCAA and FIVB or 10 feet from the net for the National Federation of State High School Associations. It separates the front court from the back court. What is the volleyball net size and height? Volleyball coaches and players will find these guidelines useful for establishing the correct net size and height, whether they coach or play in professional leagues (indoor or beach volleyball) or Olympic, NCAA college, high school, middle school or youth leagues. The implementation of regulation net heights and dimensions is critical to achieving a fair playing field for all participants. Follow these guidelines for all age groups and genders. The official size of a volleyball net is 32 feet long by 39 inches tall. This is consistent for outdoor volleyball. Net height measurements should be taken from the center of the net. Make sure the sides of the net are not more than 3/4 inch higher than the regulation height. Here are guidelines for all the different net sizes and dimensions. Men’s indoor and beach volleyball net height is 7 feet, 11-5/8 inches (2.43 meters) tall. Co-ed net size and height is the same. Women’s indoor and beach volleyball net height is 7 feet, 4-1/8 inches (2.24 meters) tall. How tall should the net antenna be? 32″ tall from top of net. For sitting (disabled) volleyball leagues, the net is lower to the ground. International net height is 3 feet, 9.28 inches (1.15 meters) tall for men’s leagues. For women, the net height is 3 feet, 5.34 inches (1.05 meters) tall. For youth volleyball, the regulation net height is the same for girls and boys (ages 11-12): 7 feet (2.13 meters) tall. Boys age 10 and under use the same net height as youth volleyball. Girls age 10 and under use a slightly shorter net at 6 feet, 6 inches (1.98 meters) tall. How tall are the poles holding the volleyball net? The two end poles measure 8 feet 4 inches tall. How far apart are the net poles for volleyball? The standards should be 36 feet apart. What distance is the pole from the sideline? Three feet outside of the playing court. How wide are the lines on a volleyball court? The court’s lines are two inches wide. The center line is four inches wide. What should the ceiling height be? At minimum, the ceiling should be 23 feet high. What is the size and weight of a volleyball ball? A volleyball ball weighs between 9.2 and 9.9 ounces. The adult-sized ball is 25.5 to 26.5 inches in circumference (65 to 67 centimeters). William G. Morgan of Holyoke, Massachusetts in 1895. He originally called it “Mintonette”, after the game of badminton. When did volleyball become part of the Olympics? It was first a demonstration sport in the 1924 Olympics in Paris. In 1964, it became a medal sport at the Tokyo Olympics. How many times does a player jump in an average match? What is the fastest recorded serve? 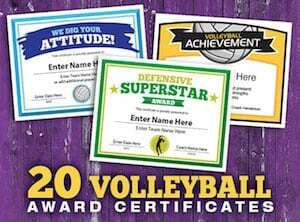 What are some funny volleyball words / terminology? 1.) Pancake: When a player’s palm is flat on the floor and the ball pops up. 2.) Goofy: Jumping with the wrong foot first. 3.) Kong: A one-handed block. 4.) Joust: When the ball is directly above the net and opposing players try to push it to the other side.